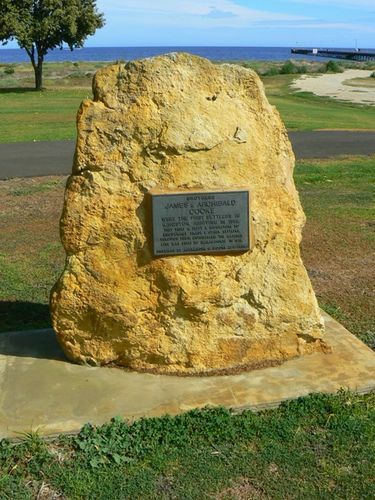 A memorial commemorates the first settlers of Kingston who took up land near Maria Creek in 1856. Archibald Cooke was born in Scotland and immigrated to South Australia in 1837. His brother James joined him six years later. They first held property at Wellington and the area that they gave their name to, Cooke Plains. In 1854 Archie Cooke rode from Wellington along the Coorong to the Maria Creek and became interested in the land and the calm waters of Lacepede Bay as he was aiming to become involved in shipping and trade. Two years later after receiving a grant of land, he and James returned in their cutter "Swallow". Their grant consisted of 3,496 acres and with vast grazing rights to eleven and a half miles of sea front on Lacepede Bay. They still owned their land at Wellington & Cooke Plains. The brothers combined pastoral pursuits with mercantile and shipping business. Archie managed the former and James the latter. Through their efforts a short jetty was constructed and Port Caroline was founded. The brothers opened up the first coastal service to Lacepede Bay, built a large wool store and supported bullock teams which brought produce to and from the Tatiara and other settlements. In 1876 the longer screw pile jetty was built and James, always a businessman was instrumental in having the railway line constructed between Kingston and Naracoorte. This was officially opened in 1877. As their business grew the brothers encouraged and assisted new settlers by sub-letting portions of their land. Encourage Trade & Other Settlers. Line Was Built To Naracoorte In 1876.